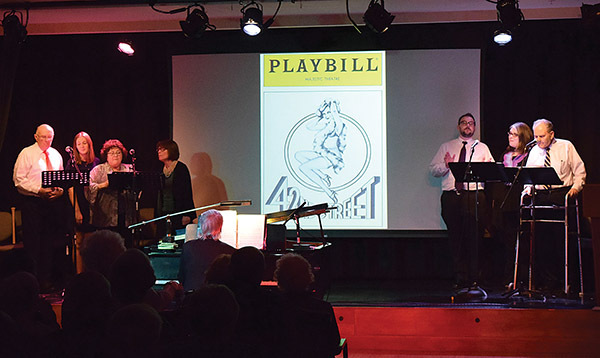 Performers recently held a fundraiser for the Brooksby Village Jewish Council. DECEMBER 7, 2017 – PEABODY – Rim Meirowitz recently taught a three-part series of classes that drew 70 fellow residents of all religions at Brooksby Village. The rabbi emeritus at Temple Shir Tikva in Winchester, Meirowitz went through the Jewish calendar and major holidays, and also led a discussion about the difference between the concept of sin in Catholicism and Judaism. “Everybody who attended learned something new and I was extremely gratified that it went so well,” said Meirowitz. When she first started at Brooksby, Schutz said, participation in Jewish life mostly centered around a monthly service led by an area rabbi. Now the Jewish activities on campus are virtually non-stop with something for everyone, including many that invite participation from the non-Jewish members of the community. Assuming the roles of both rabbi and cantor, Perlman enjoys singing in addition to leading the service. He is also available to counsel residents when needed. The council runs a wide range of programs, including a Jewish book group and a Yiddish club, as well as entertainment options, High Holiday services, fundraising events, and lectures. Feinstein marvels at the organization’s growth, even over the four years she’s lived at Brooksby. With the Hanukkah season fast approaching, Schutz oversees a busy agenda, including a sing-along for all residents to enjoy, and a nightly candle-lighting ceremony. Schutz studied at Brandeis University and received clinical chaplaincy training at Beverly Hospital. Now, she applies those counseling skills at Brooksby, where she works one-on-one with residents to help them adapt to serious life challenges and transitions.